1. At Kona Mike’s Surf Adventures you can learn to surf with the best instructors. If you already know your way around a surfboard and want to learn how to stand up paddle, you can do that too. Take full advantage of the surf and the expertise of the instructors as you take to the waves. 2. For unique things to do in Hawaii, look no further than the Ocean Rider Seahorse Farm. Here is a cross between an aquarium and a research facility where you can learn all about these magnificent creatures and even hold them at the end of the tour. 3. Hulihe’e Palace is a historic building founded in 1838 and was where Hawaiian monarchy called home. The tour offers a fascinating look at Hawaii’s past, set amid gorgeous grounds with amazing guides. 4. Whether you arrive on the Big Island via Cruises from Honolulu or from another destination, the Light Sport Aircraft Flight offers spectacular views of the Island from above. Operated by Advanced Recreation of Hawaii, come soar in a light plane and remember to keep an eye out for the whales! 5. Kona Mountain Coffee Visitor Center makes the list for the decadent coffee you can taste and buy. Enjoy your coffee with spectacular views and get some shipped home, too. 6. The Coral Reef Snorkel Adventure is one of the things to do in Kona Hawaii. 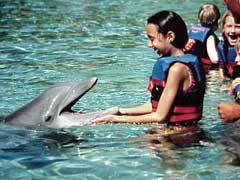 Here you can snorkel and swim with dolphins during the morning charters, or with manta rays during twilight cruises. Food is included and the groups are kept small. 7. Hawaii Forest and Trail offers many different tours, including a Twilight Volcano Tour that shouldn’t be missed. See the volcanoes, the surroundings and the stars in this amazing tour. 8. The H.N. Greenwell Store Museum offers visitors a walk into the past. Experience what Hawaii was like in the 1880’s when you take this tour. 9. Kiholo Bay is one of the many things to do in Kona Hawaii that won’t cost you a penny. See the Queen’s Baths, freshwater that comes from underground, the beautiful coast, sea turtles and wild goats. This Bay has marvellous places to snorkel and swim and is set amid the Hawaiian beauty of the region. 10. The Royal Footsteps along the Kona Coast is something to see as it offers something for everyone. See restaurants, shops, burial grounds, temples, palaces and more all on one road. The Pride of America cruise Hawaii is famous for its Hawaii Island hopping, and will make a stop in spectacular Kona, as do many other cruise ships. Enjoy all that the big island has to offer when you discover the things to do in Kona, Hawaii.